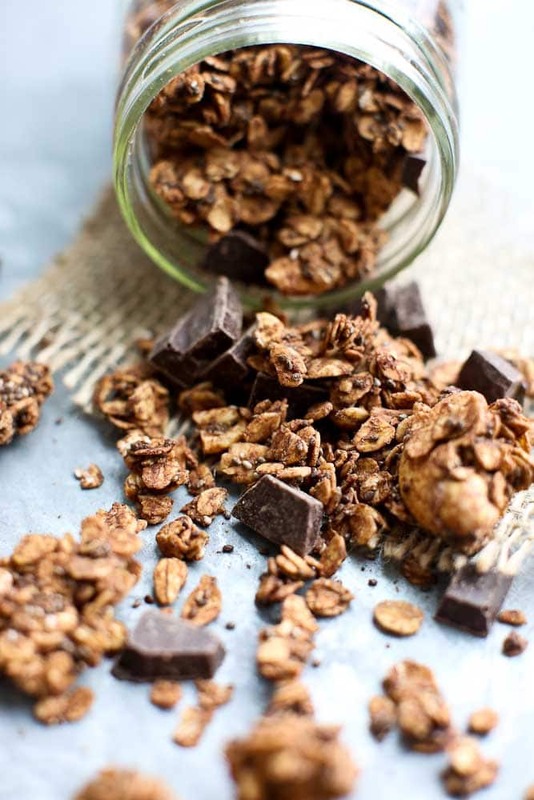 This Chocolate Chia Granola is loaded with nutrients and doesn’t skimp on flavor! It’s a perfect topping for Silk’s Almond Dairy-Free Yogurt Alternative. My kids have been on a huge granola kick lately. 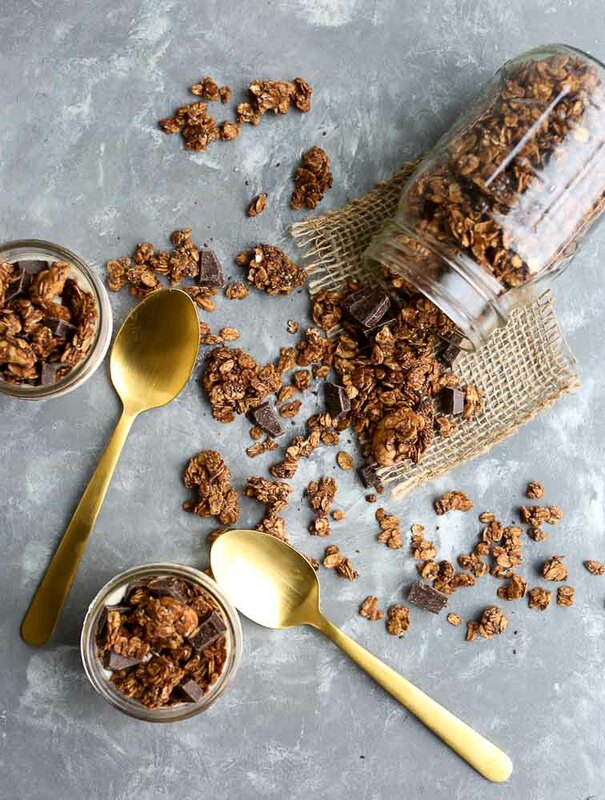 They have one request when it comes to granola flavors: must include chocolate. I decided to fulfill their request with a Chocolate Chia Granola that’s filled with nutrients. It’s the perfect granola to meet what mom wants and what kids want. 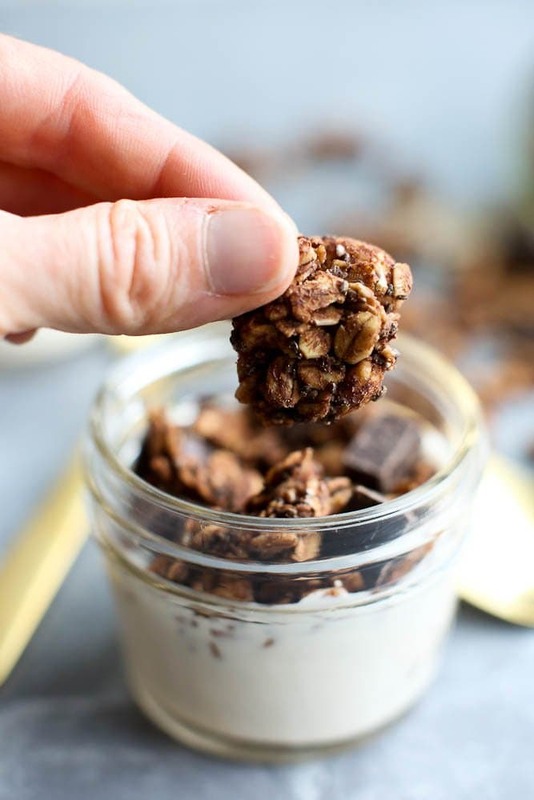 This Chocolate Chia Granola is filled with goodness! 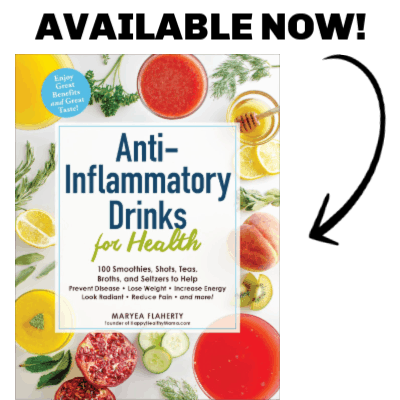 Check out how every ingredient is filled with nutrients that fuel our bodies and keep them functioning properly. I love the saying “Count nutrients, not calories.” We really should be looking at the nutrients that our food provides, not just if it’s high or low calorie. That’s definitely what I’m thinking about when I’m feeding myself and my kids. Thankfully, I know that nutrient-dense foods are can also be 100% delicious. 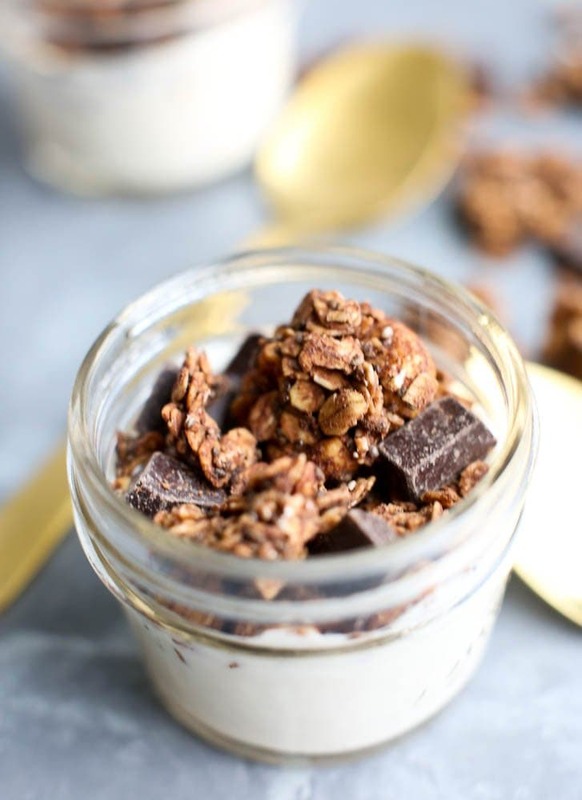 I don’t feel the least bit deprived and neither do my kids when we eat this Chocolate Chia Granola. It’s got a great flavor thing going on. It’s lightly sweet, with a touch of saltiness, a hint of cinnamon, and great chocolate flavor. It’s works really well. If you’re used to a much sweeter granola, I suggest reducing the oats to 3 3/4 cups and adding 1/4 cup coconut sugar, Sucunat, or even regular sugar. 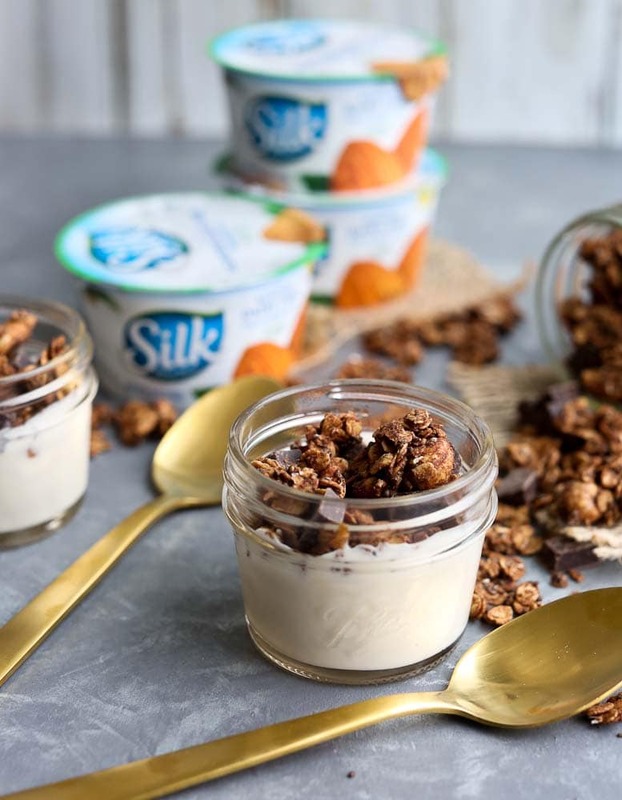 Our favorite way to enjoy this Chocolate Chia Granola is as a topping on Silk’s Dairy-free Yogurt Alternative. Did you know Silk came out with an almond (non soy) variety? OMG it’s my favorite Dairy-Free Yogurt Alternative yet! I love the flavor and creaminess of this Dairy-Free Yogurt Alternative so much. 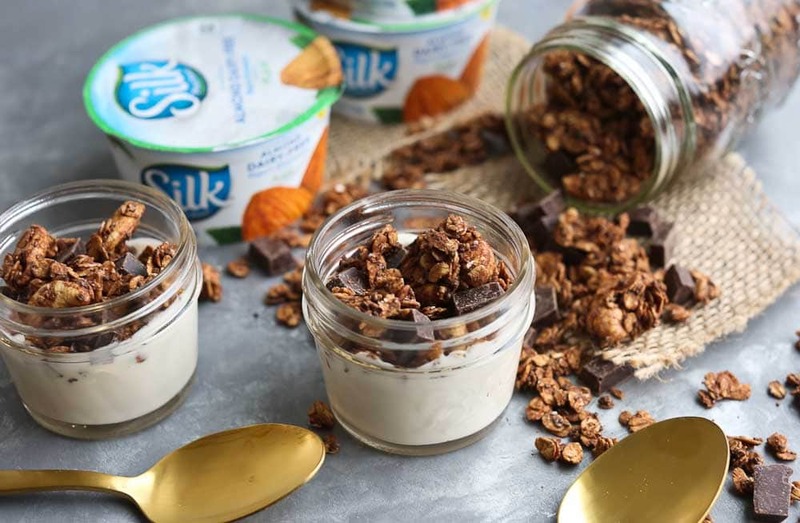 The Chocolate Chia Granola is perfect on top of the plain Silk Almond Dairy-Free Yogurt Alternative. 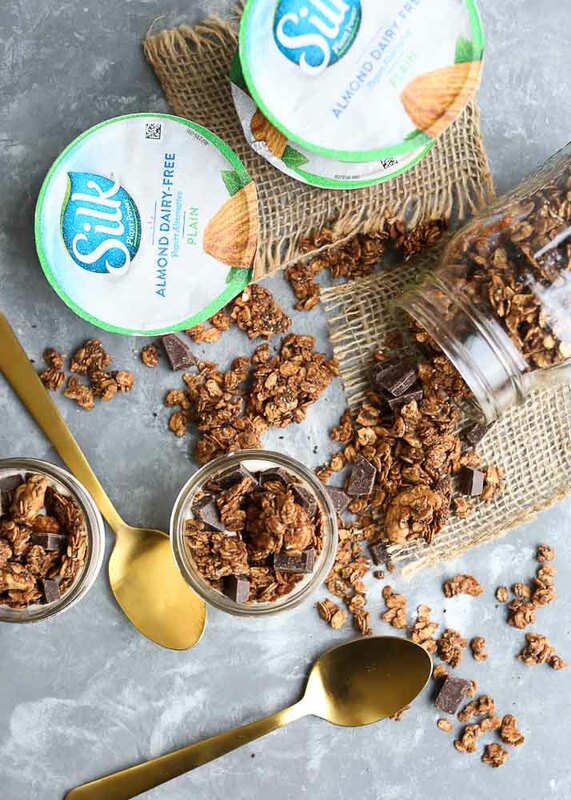 Silk offers their Almond Non-Dairy Yogurt Alternative in plain, vanilla, peach, and dark chocolate coconut. They are soooo creamy and each has 5-6 grams of protein in their individual serving cups. Click here to use their store locater and find out where you can purchase these in your area! Also, wouldn’t you love a coupon to snag your Dairy-Free Yogurt Alternative with a discount?! Umm..yeah! Click here to get your coupon. I hope you enjoy this nutritious granola as a perfect topper for your Almond Non-Dairy Yogurt Alternative! This healthy granola is filled with antioxidants and the superfood chia seeds! In a large bowl, mix together the oats, cocoa powder, chia seeds, cashews, salt, and cinnamon. In a separate bowl, mix together the maple syrup, almond butter, and coconut oil. Pour the wet mixture onto the dry and stir to combine. Spread the mixture on 1-2 rimmed baking sheets and bake in the preheated oven about 40-45 minutes. Half way through the baking time, use a spatula to carefully flip the granola. Watch the granola at the end to ensure it doesn’t burn. Oven temperatures can vary and it can go from perfectly done to burned quickly. Once it is finished baking, let it cool on the baking sheet, undisturbed, at least one hour. The chunks form when you don’t touch it at all. If you don’t like big chunks, you can use a spatula to mix it up. If you love chunks, don’t touch it for AT LEAST one hour! Add the chocolate chunks before storing. You may substitute whole almonds, walnuts, or pecans for the cashews. Peanut butter, cashew butter, or sunflower seed butter all work well as substitutes for the almond butter. I love to see when you make a Happy Healthy Mama recipe! If you make this, please tag me on Instagram @happyhealthymama so I can check it out. Would you like to save this recipe for later? Here’s an image so you can save it on Pinterest.